Mabul is a 20 hectare tropical island located 12km off the south-east coast of Sabah in Borneo, 15km north of Sipadan Island. The island itself is home to cultural water villages and Bajau people, described in our About Sabah page. Not so long ago this reluctantly adopted sister to Sipadan was a little known destination. However the advent of Muck Diving placed Mabul on the same stage as other world class macro destinations such as in Indonesia and Suluwesi. To say that it offers only Muck Diving is an injustice as it actually has some fantastic walls, very healthy coral growth and generally fair to good visibility. All dives in the area have a top reef conveniently beginning at safety stop depths of approximately 5m where one can float by and admire the view. 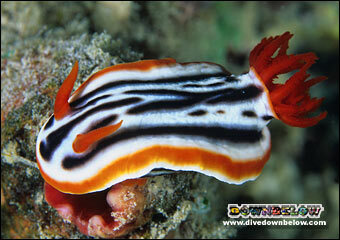 There is a variety of dive sites to dive near Mabul that requires your dive skill to be fresh. So if you’ve not been in the water for a while and need a Scuba Review prior to scuba diving at Mabul, why not visit us on Gaya Island first? You’ll enjoy further discounts at Sipadan Kapalai Dive Resort or Sipadan Mabul Dive Resort. Lobster Wall consists of three walls to depths of 35m – 37m. Separated by sloping reef it forms a channel with the submerged reef opposite. The walls are covered in yellow, blue and orange soft hanging corals and sponges, providing food for a large variety of nudibranch. Sea fans are home to cryptic Pygmy seahorses, turtles, frogfish, schools of yellow snapper and ribbon eels. The occasional Flamboyant Cuttlefish are also residents of the reef. Strong currents are present making it a challenging macro site but a great ride. Ray Point is a great choice when the currents are strong elsewhere as this sheltered site slopes to a maximum of 22m. As the name suggests it’s home to many Spotted Rays, as well as all the usual suspects one can hope to find, with plenty of Nudibranch, Ribbon Moray Eels and Flying Gurnards. The reef slopes to approx 24m and joins a sandy bottom where one can find fields of Garden Eels. If disturbed they retreat into their burrow simultaneously creating a wave effect extending about 3m ahead of the intruder which is quite fun to see. The top reef is great for critters and home to Leaf Fish, Seahorses, Mantis Shrimps and Anthias. The gently sloping reef is a relaxing and visually rewarding dive site suited to all levels of diver. Even when the current is strong this site remains manageable with a reef sloping to a maximum of 12m – 14m. It provides shelter for frogfish, Mandarin fish, cuttlefish, ghostpipefish and many juvenile macro species. The sandy substrate, on the other hand, teems with gobies and Moray eels. In our opinion this site is often under rated. We almost always discover something special here although you need to dive it slowly and maintain a sharp eye. Froggy Lair consists of a large, gently sloping sandy area with artificial reef structures of tyres and frame constructions. It’s a hugely successful dive site project and home to a variety of marine life. Expect to encounter jacks, snappers, giant groupers, many frogfish and ghostpipefish to name a few. At maximum 25m deep, the nutrient rich waters produce limited viz, sometimes as low as 8m. Its a tricky dive to navigate, so we’d recommend staying with your guide to get the most out of the area. The environment around the base of Seaventures can product strong currents around full and new moon. During this time the site should be dived around slack tide with experienced guides that will assist with timing. With a maximum depth of 19m, pelagic fishes such as garfish, jacks and Big Mouth mackerel cruise the cylindrical leg structures. Bumphead parrot fish, the odd turtle and schools of snapper are regular visitors. Various artificial reef structures support a wide range of macro life. Nudibranchs, eels, octopus (including the Mimic), lionfish, leaf fish, frogfish, crocodilefish, Pygmy seahorses and gobies can all be found here. The scorpionfish and stonefish that live here are some of the largest we have seen. Make the most of your Mabul diving and take advantage of our TWO Centre Diving Destination Offers! Contact us for more details.